The Louisiana Purchase was the acquisition by the United States of approximately 530 million acres (828,000 sq mi or 2,100,000 km²) of French territory on April 30, 1803, at the cost of about 3¢ per acre (7¢ per ha); totaling $15 million or 80 million French francs. Including interest, America finally paid $23,213,568 for the Louisiana territory. The land purchased contained all of present-day Arkansas, Missouri, Iowa, Oklahoma, Kansas, Nebraska, Minnesota south of Mississippi River, much of North Dakota, nearly all of South Dakota, northeastern New Mexico, northern Texas, the portions of Montana, Wyoming, and Colorado east of the Continental Divide, and Louisiana on both sides of the Mississippi River, including the city of New Orleans. (The Oklahoma Panhandle, and southwestern portions of Kansas and Louisiana were still claimed by Spain at the time of the Purchase.) In addition, the Purchase contained small portions of land that would eventually become part of the Canadian provinces of Alberta and Saskatchewan. The land included in the purchase comprises around 23% of the territory of the modern United States. The purchase was an important moment in the presidency of Thomas Jefferson. At the time, it faced domestic opposition as being possibly unconstitutional. Although he felt that the Constitution did not contain any provisions for acquiring territory, Jefferson decided to purchase Louisiana because he felt uneasy about France and Spain having the power to block American traders' access to the port of New Orleans. When Dr. William 'Fat Doctor' Flood, the representative of Governor Claiborne of the Orleans Territory, was dispatched to the Mississippi coast to hoist the flag of the United States in January 1811, he found the population between the Pearl River and Biloxi to be about four hundred people chiefly French and Creoles. Dr. 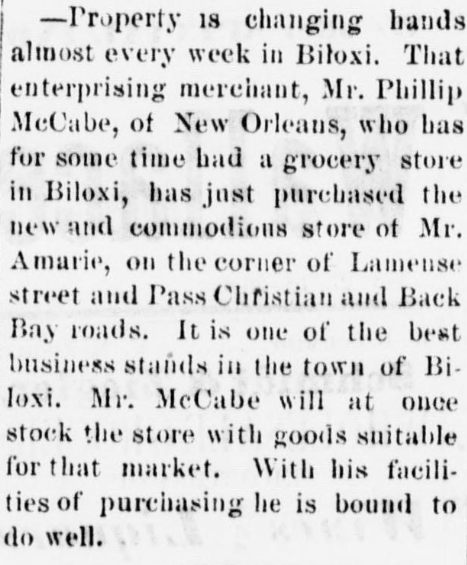 Flood in his report to Governor Claiborne wrote: proceeded to the Bay of Biloxi, where I found Mr. Ladnier (Jacques), and gave him the commission (Justice of the Peace). 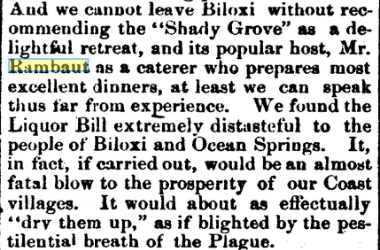 He is a man of excellent sense, but can neither read or write, nor can any inhabitants of the bay of Biloxi that I can hear of. They are, all along this beautiful coast, a primitive people, of mixed origin, retaining the gaiety and politeness of the French, blended with the abstemiousness and indolence of the Indian. They plant a little rice, and a few roots and vegetables, but depend on subsistence chiefly on game and fish. I left with all these appointees copies of the laws, ordinances, etc. But few laws will be wanted here. The people are universally honest. There are no crimes. The father of the family or the oldest inhabitant, settles all disputes......A more innocent and inoffensive people may not be found. They seem to desire only the simple necessities of life, and to be let alone in their tranquility. I am greatly impressed with the beauty and value of this coast. The high sandy lands, heavily timbered with pine, and the lovely bays and rivers, from Pearl River to Mobile will furnish New Orleans with a rich commerce, and with a delightful summer resort. For a cantonment or military post, in consideration of the health of the troops, this whole coast is admirably fitted. Jackson County was created on December 12, 1812 as part of the Mississippi Territory. Mississippi entered the Union on December 10th as the 20th State of the United States of America. The Picayune began publishing it newspaper at 38 Gravier Street at NOLA on January 25, 1837 by Francis A. Lumsden and George Wilkins Kendall (1809-1867). The four page journal cost 25 cents per week or 6 1/4 cents per issue, the value of a Spanish picayune. A three months subcription was $2.50. By early November 1837, the paper became The Daily Picayune. In 1914, The Daily Picayune merged with The New Orleans Times-Democrat to become The Times-Picayune. Harrison County, Mississippi was formed from Hancock and Jackson County, Mississippi on February 5, 1841. Peter Flanagan, early Biloxi hotelier, died in 1846 at Biloxi. John Hahn (1806-1847), proprietor of the Magnolia Hotel died. 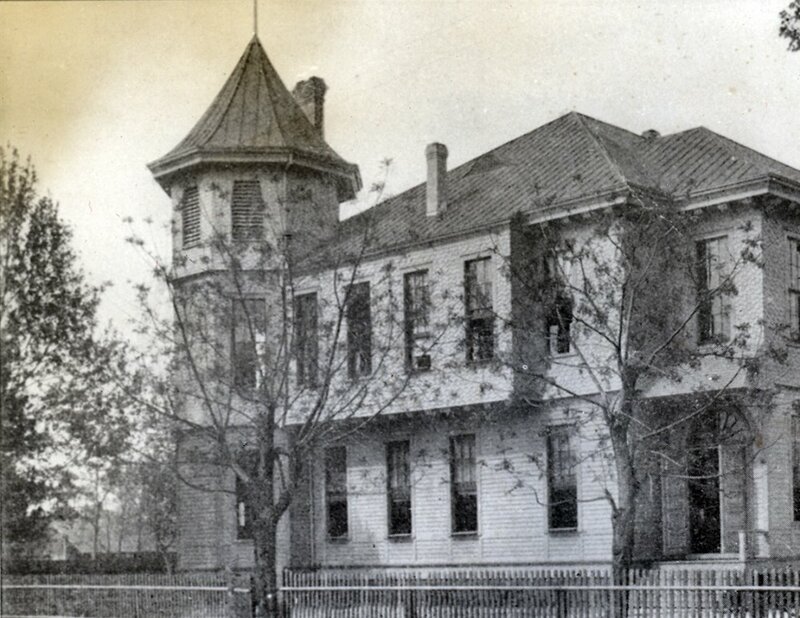 Madame Pradat's Live Oak Hotel was operating on Biloxi's East Beach road. John W. Nixon (1782?-1849) died at Biloxi on June 17th. 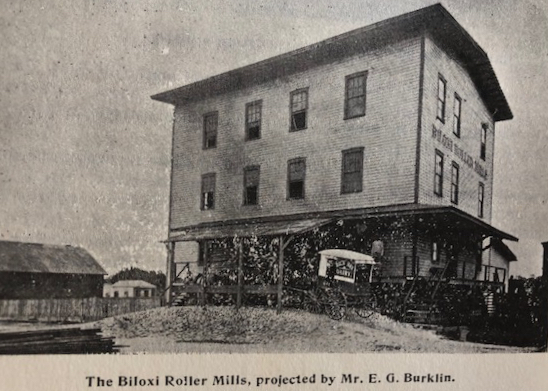 Biloxi was incorporated on February 18, 1850. First America's Cup race sailed at the Isle of Wight on August 22nd. The 1853 Yellow Fever epidemic at New Orleans killed about 10,000 of the 30,000 persons infected with the mosquito borne virus. 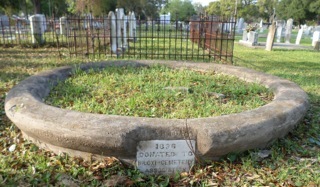 It earned the Crescent City the epithet "Necropolis of the South". The Last Islands [Isles Dernieres] Hurricane mauls this seaside resort off of Terrebonne Parish, Louisiana on August 11th and kills about 200 people. According to modern estimates by the NOAA the storm was probably a Category 4 hurricane with central pressure of around 934 mb. It tied with Hurricane Hugo as the 10th most intense hurricane to hit the mainland United States. Pierre Pascal Hugonin (1801-1857), native of France and Justice of the Peace at Biloxi, died on September 7, 1857. He was replaced by William H. Norberg (1829-1860+), native of Massachusetts. Dr. Andreas Byrenheidt (1786-1858), Biloxi physician and native of France, expired on March 4th. In 1859, Joseph H. Bellande (1813-1907) sold to Bishop William H. Elder of the Diocese of Natchez a lot measuring 192 x 100 feet for the first site of St. Alphonsus Catholic Church in Ocean Springs on Porter Avenue for $100. The War of the Rebellion or American Civil War commences on April 12, 1861 in South Carolina. The Civil War ends on April 9, 1865 in Virginia. On October 29, 1870, the New Orleans, Mobile, & Chattanooga Railroad (Chartered 1866) completed the rail line between Mobile and New Orleans. Rail service commenced on November 21, 1870. The N.O.M. 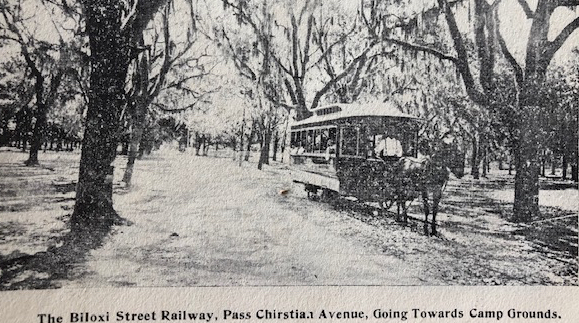 & C. was reorganized on April 18, 1871 and became the New Orleans, Mobile & Texas Railroad. Captain T. Frederick Nehls (1811-1877), Prussian immigrant mariner and mail carrier, expired on March 7, 1877. The L&N Railroad leased the property of the N.O.M. & T. Railroad on May 8, 1880. In April 1881, Father Francis Janssens (1843-1897), Dutch born missionary Catholic priest, was appointed the fourth Bishop of the Diocese of Natchez. 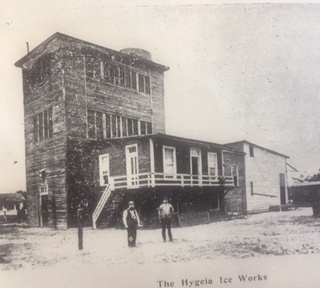 The Barataria Canning Company was founded. Charles Turner Howard (1832-1885), father of Biloxi philanthropist, Frank T. Howard (1855-1911) and Harry T. Howard (1856-1930) and proprietor of the Louisiana State Lottery at NOLA, died on May 31st. Jefferson Davis (1808-1889) died at New Orleans on December 6th. His remains were interred in the Metairie Cemetery. His corporal remains were later interred on May 31, 1893 at Richmond, Virginia. H. Eugene Tiblier Jr. (1866-1936), found a sunken French vessel in the Back Bay of Biloxi beneath the shallow water over the family oyster lease, near the L&N Railroad bridge. 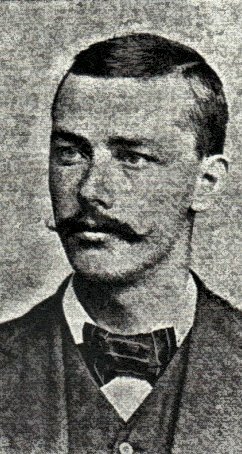 Captain Tiblier hired Joseph "Pep" Suarez (1840-1912), who owned the schooner, Maggie, to assist in the salvage of artifacts from the hold of the sunken ship. His sons, Albert Tiblier and Vital Tiblier, dove on the oyster bank during the salvage operations. According to a report of The Pascagoula Democrat-Star of September 23, 1892, the Tiblier family recovered four cannons, swords and scabbards, some muskets, cannon balls, wooden sheaves, fire brick, iron braces, and rock ballast. The Blizzard, a weekly newspaper, was edited and managed by Louis Rosenthal. Cost $1.50 per year. The October Storm or Cheniere Caminada Storm hits near Grand Isle, Louisiana on October 1st. In January, Governor Anselm J. McLaurin (1848-1909) began his four year term as Mississippi’s chief executive. His term ended January 1900. The Spanish American War began on April 21st. 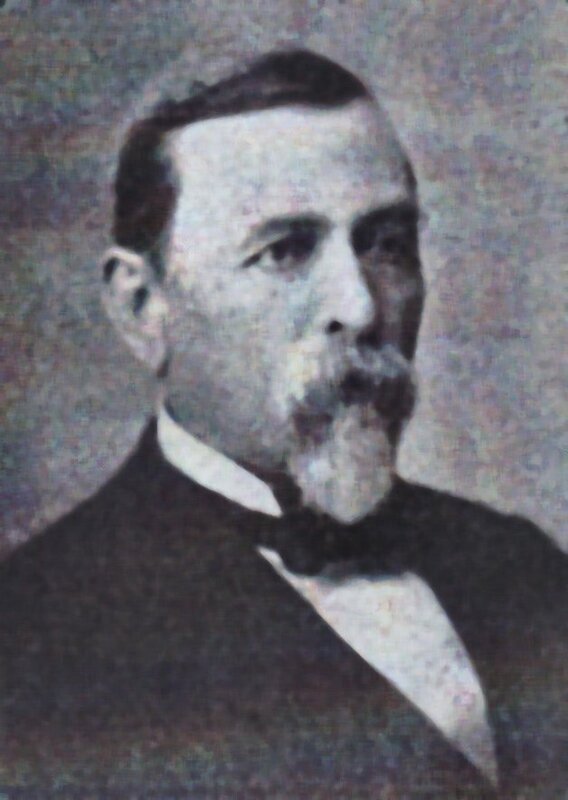 Mayor Harry T. Howard (1856-1930) resigned his office in early September and was replaced by Dr. Daniel A. Nash (1858-1904), Alderman Ward III, who was appointed to the office by Governor McLaurin on September 5th. 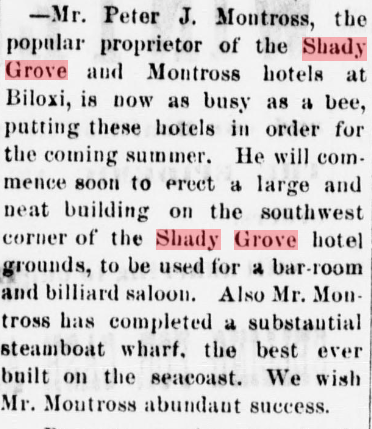 (The Biloxi Daily Herald, September 1, 1899, p. 8 and September 9, 1899, p. 1). 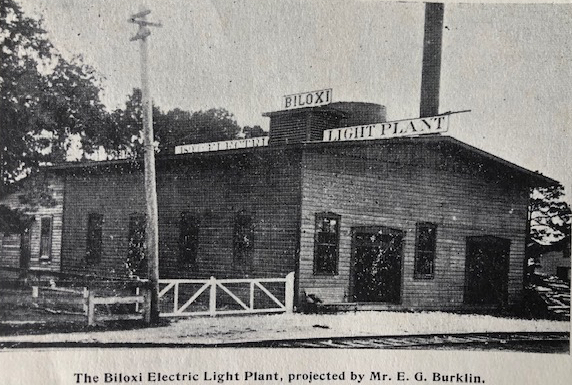 The Biloxi Benevolent Association was founded on January 11th.